Our insurance company prefers (strongly) that we stay out of Florida during Hurricane Season. So this summer we set up shop at the Port City Marina in Wilmington NC and got hit by Hurricane Matthew. 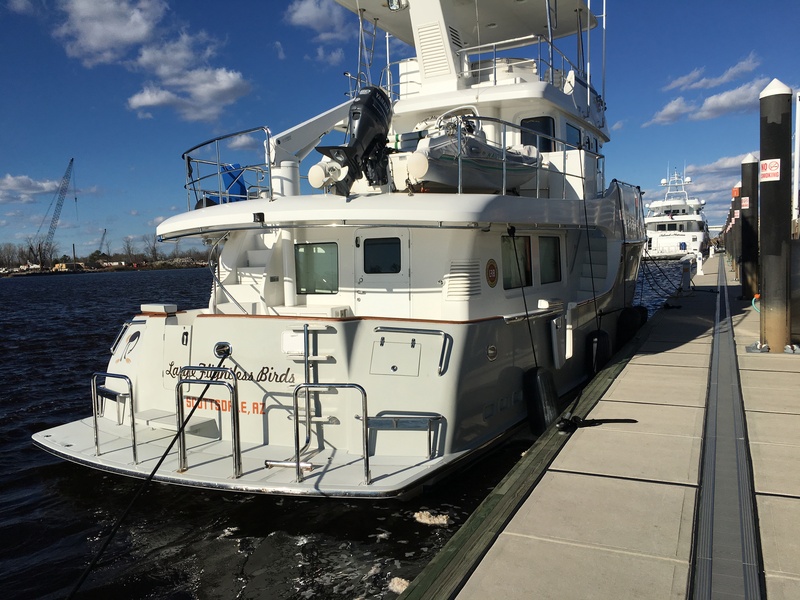 You can read the various blog entries we posted during the storm; while conditions never got really bad at the NC marina turns out that we saw more wind, rain and storm surge than our Florida marina experienced. Go figure. With hurricane season behind us we scheduled our trip to move LFB back to Florida for the winter chartering season. Our captain enlisted his son to help with the re-positioning trip and made arrangements for an old friend and fellow captain to join us for the adventure. Plan was for the four of us to head out of Wilmington on the 30th or 31st of December and make the dash to Jupiter. If the weather holds up we do a straight 3 day trip down the Atlantic coast line, staying outside of the gulf stream. If the weather goes bad, we’d pop into the intercoastal and take our sweet time. First order of business was to prep the boat for the trip. 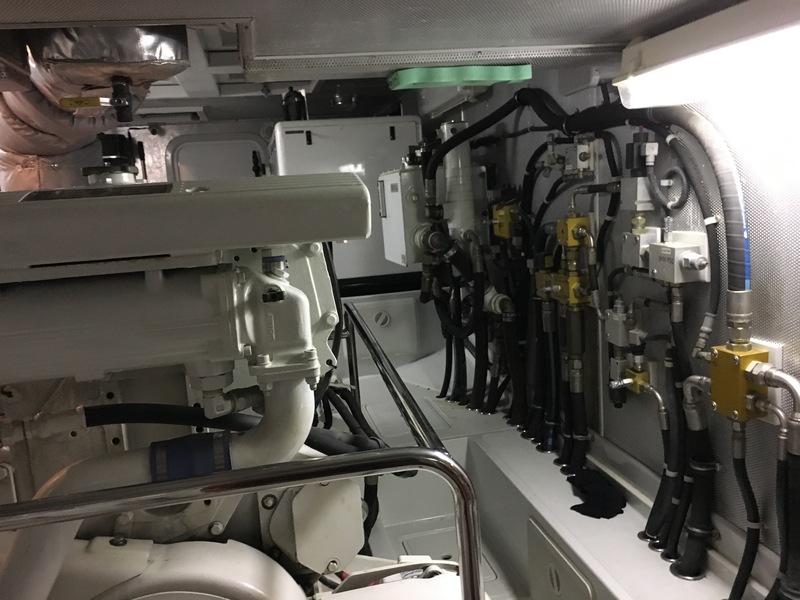 That meant checking all the fluids – coolant level in all four engines (main, wing, both gensets), oil levels in all four engines, hydraulic fluid for the extensive system that feeds the stabilizers, bow and stern thrusters, windless and anchor wash and (if needed) the emergency bilge pump. Also looked at fuel levels and made sure that all the valves were properly positioned and that the fuel filters all looked good. After reviewing the fuel levels we decided to add 500 gallons to make sure we have plenty in reserve, and we transferred a few gallons into the wing engine day tank. The wing engine has it’s own supply tank, and the wing engine provides power to all the hydraulic systems other than the stabilizers, which run off the main engine. We checked the condition of the various storage tanks and filled our fresh water tank to the top. We have two water makers on LFB but no sense leaving the dock without all the water we can carry. 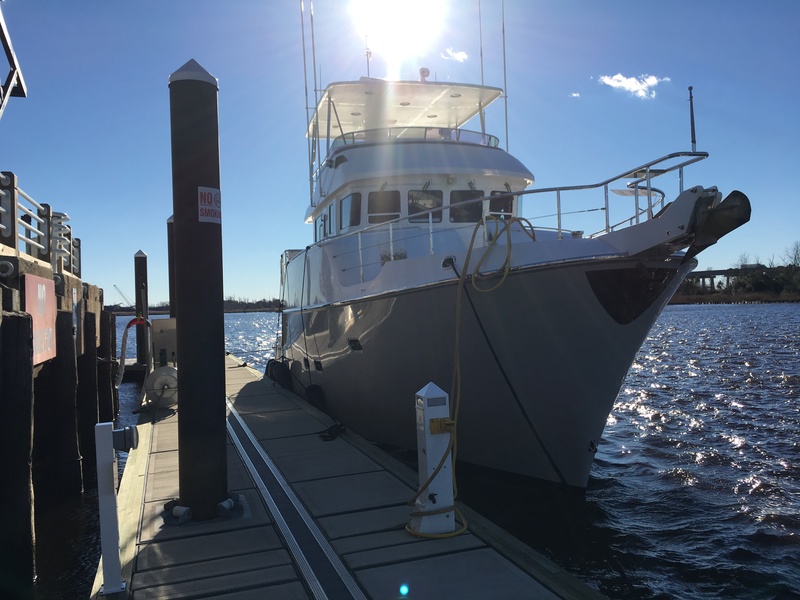 One item that many of the Nordhavn owners have dealt with is the issue of soot from the dry exhaust stack for the main engine. 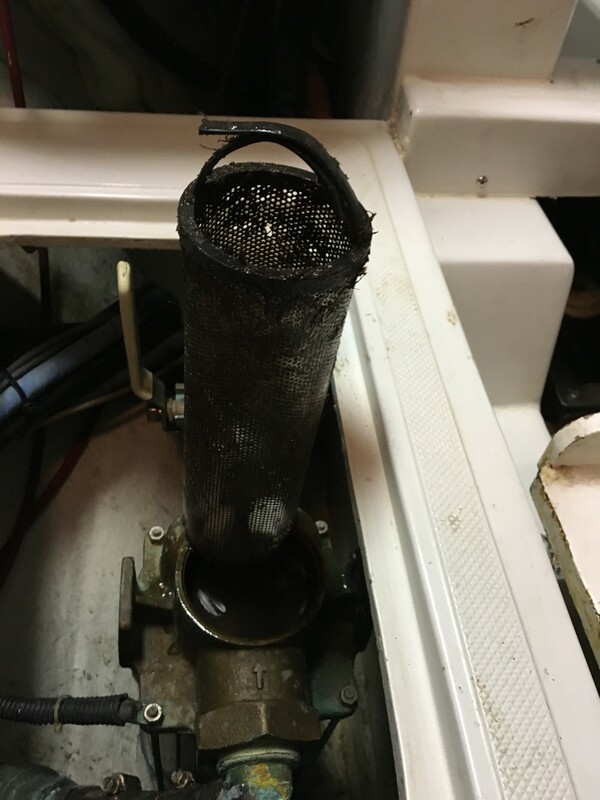 When you start the engine it has a nasty habit of throwing oily soot all over the place, its a pain to clean up on your own boat and often spreads a little cheer to the boats around you. There are a number of reasons for the issue, and many owners have tried various solutions. 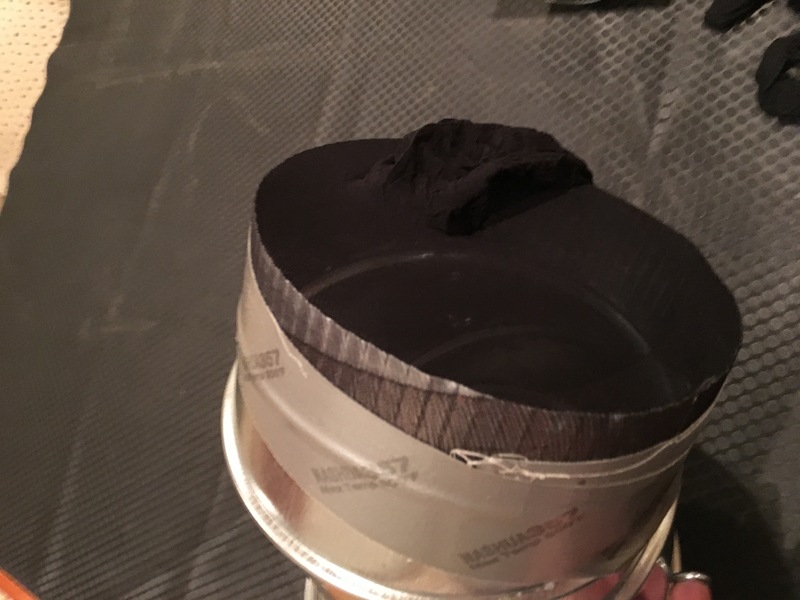 Our engineer started climbing to the top of the stack and putting one leg of a pair of pantyhose over the exhaust pipe to capture the soot. We decided to try a different approach this trip, stealing an idea from another Nordhavn owner. 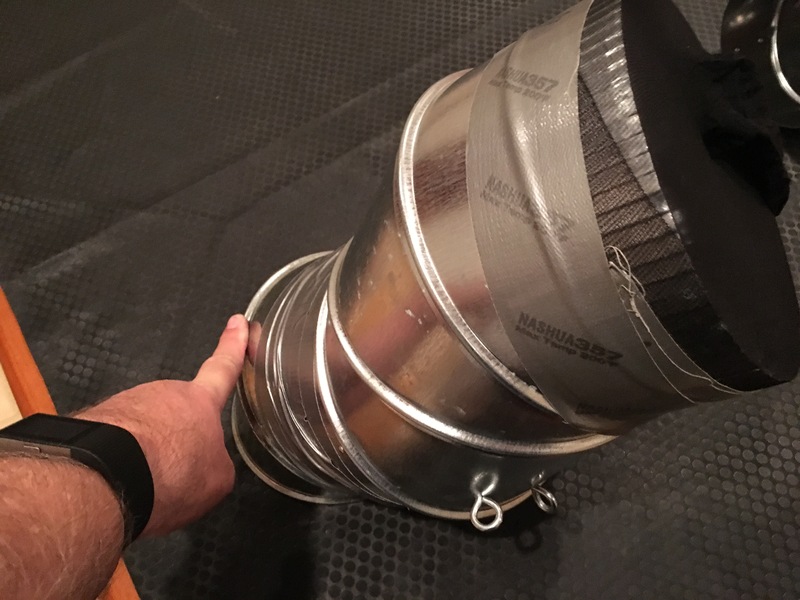 We bought a couple of flexible aluminum duct elbows, taped them together, taped the nylon stocking over one end and used a pole to place the entire device over the end of the exhaust outline at the top of the stack. Worked great, and nobody had to scamper up the dry stack. 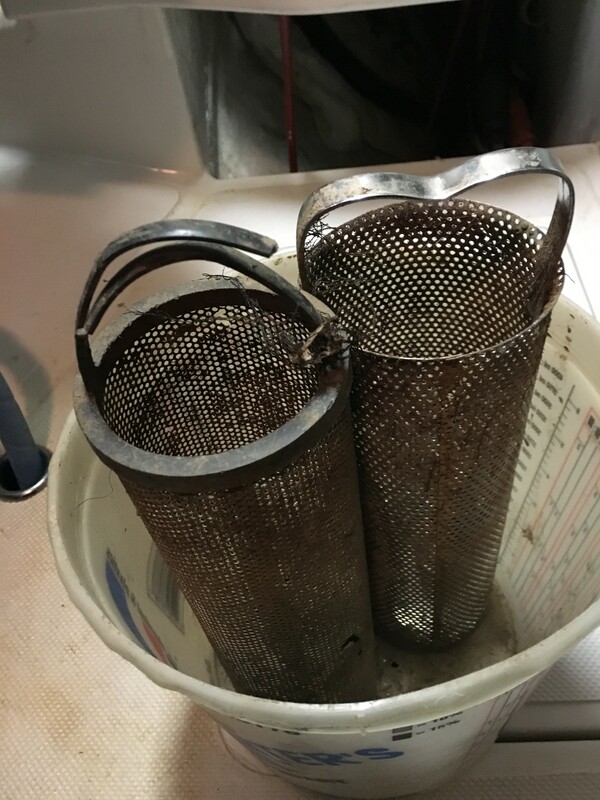 We also checked the strainers. There are two strainers that capture large items before it can get to the sea chest that provides raw water to the gensets, wing engine and HVAC system. We often pull plastic bags from the strainers and sometimes a jelly fish but mostly its barnacles and organic sea life taking root in the system. We carry a few spares so we always have a clean set to put into the strainers. Getting to them is easy, a panel in the engine room on either side of the main engine revels the strainer. Close two valves, open the top and take out and replace the basket. 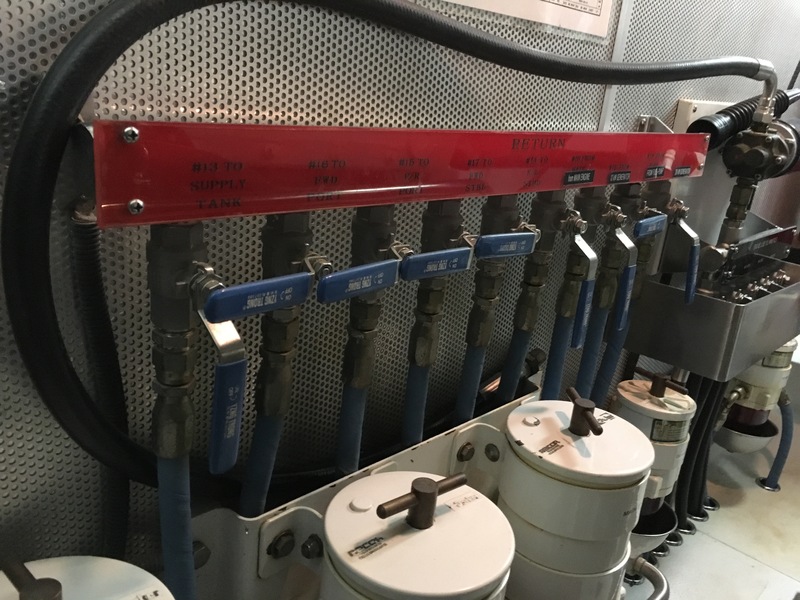 Put the top back, open the valves (very important), check for leaks and close the panel. Easy easy..
With basic prep complete we fired up the 20K getset, the main and wing engine. Fired up all the electronics, made sure the computers and radars were working, checked the instruments, unhooked shore power, took in the lines and moved over the fuel dock to take on our 500 gallons. 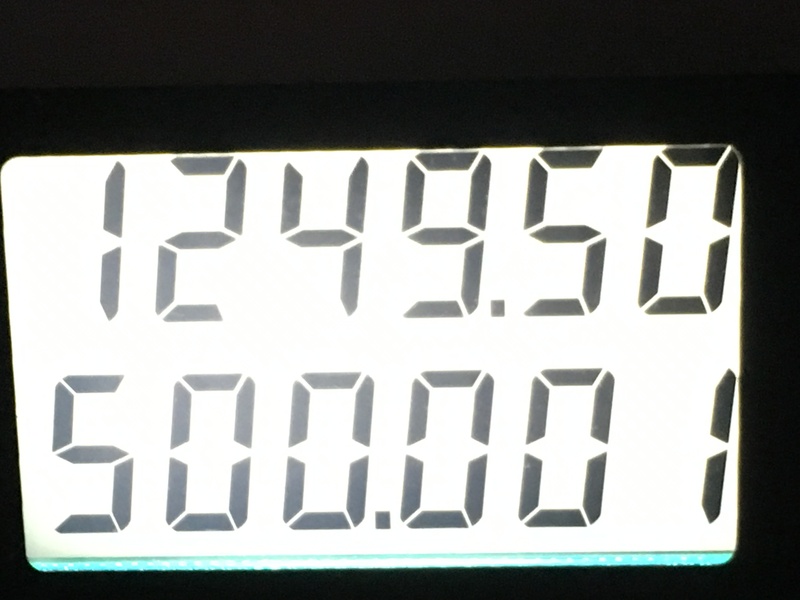 Last time we filled up was during the summer, paid about $1.85 a gallon. Prices are up a bit since then. That’s $2.499 a gallon. The gang at the marina were terrific, since we were heading out first thing the next morning they let us stay at the fuel dock for the night. That puts us right on the Cape Fear River, the wind was a little gusty and the temperature had us cranking up the heat but the river was pretty calm. 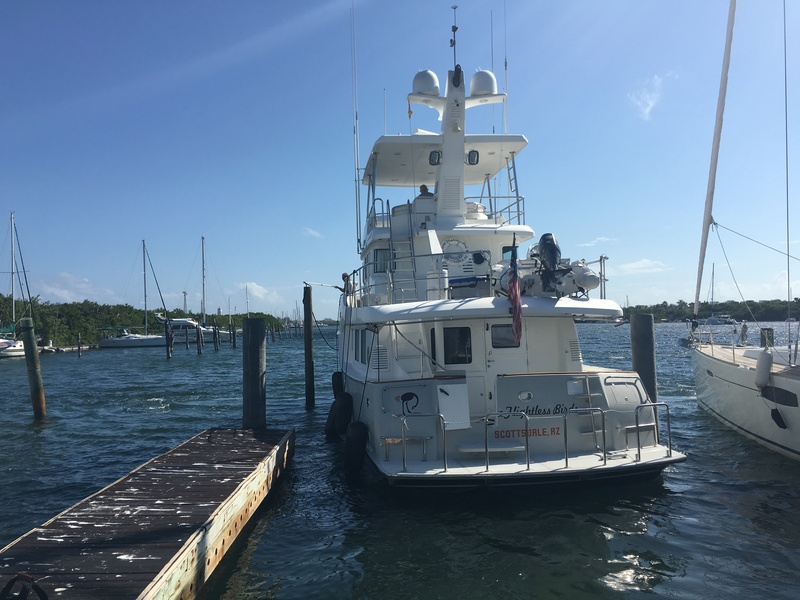 With the boat prepped we headed out to provision for the trip – and modified the shopping list because we got word that our relief captain would not be making the trip after all. So we were down to three, the captain, his son and the great auk. With the food locker well stocked with essentials (the captain loves Doritos and sweat tea) and the frig and freezer stocked we headed to bed early so we could be on the river at first light.